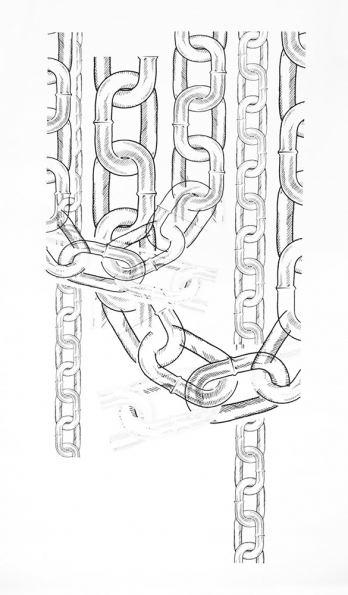 To accompany his exhibition, The Foundation, Patrick Staff has produced a new limited edition artwork, Chains (Wallpaper). The edition continues the artist’s use of the chain motif which recurs throughout his film The Foundation. The edition references the theatrical set constructed for the video, where the print functioned as a draped backdrop in the dungeon scenes. Re-designed as a repeating pattern, Chains (Wallpaper) suggests possible new usage as wallpaper or framed as a preserved fragment of a previously decorated interior. For Patrick Staff, specific materials evoke the Tom of Finland Foundation as a physical, architectural environment with both domestic and archival functions, and its complex, shifting state as a political, communal and libidinal space.